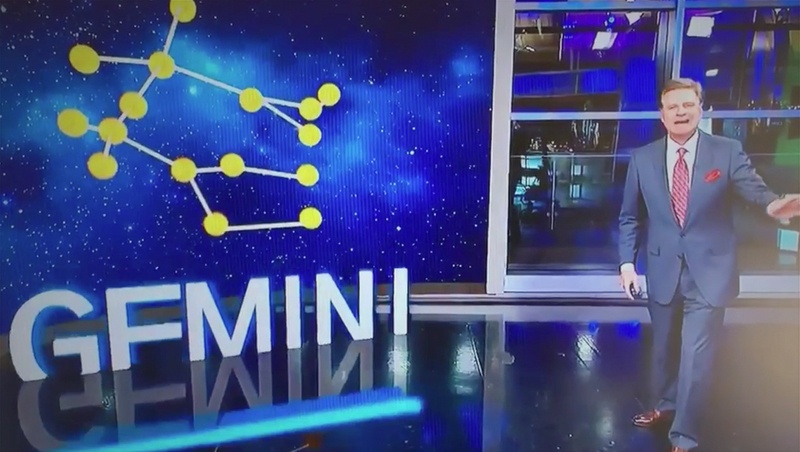 WFAA, the Tegna owned ABC affiliate in Dallas, used augmented reality to illustrate the scientific concepts behind the Geminid meteor shower. The segment, which aired earlier this week, originated from the station’s Victory Park studio — with the augmented graphics inserted “over” a large span of windows that were, due to lighting and darkness outside, mostly showing reflections of the interior of the studio. Meteorologist Pete Delkus started at the anchor desk before the camera followed him across the studio — giving viewers a glimpse behind the scenes, including the chroma key wall. The control room then inserted what was supposed to mimic a curved video wall that appeared to “connect” to one of the metal frames in the studio windows. Floating in front of this was a 3D model of the Gemini constellation (for which the meteor show is named) along with key facts about the science behind the phenomenon. At the start and end of the augmented reality portion of the segment, the yellow spheres representing stars “zoomed” in and out of the screen.